SEATTLE--(BUSINESS WIRE)--Dec. 13, 2018-- (NASDAQ: AMZN) — Procrastinators rejoice – Prime members can shop all the way up until Christmas Eve with Prime FREE Same-Day Delivery and Prime Now. Additionally, all customers in the U.S. can enjoy free shipping on hundreds of millions of items, and this holiday season Amazon has extended the free shipping cutoff with no minimum purchase through December 18 for orders that will arrive in time for Christmas. A majority of Prime members in the U.S. have access to free one-day shipping or faster, and Amazon today announced that Prime FREE Same-Day Delivery and Prime FREE One-Day Shipping expanded this year to more than 10,000 cities and towns coast-to-coast. Plus, Prime members in more than 30 cities have access to free ultrafast delivery through Prime Now, where customers can shop many of the same products and deals that are available on Amazon.com and receive them in as little as an hour. 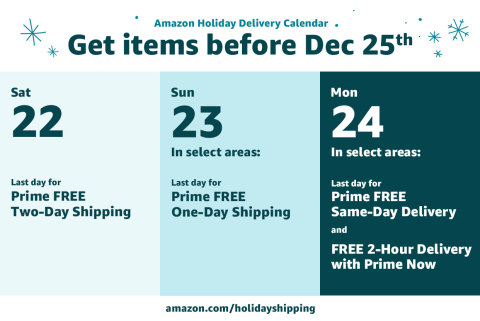 For more information about holiday shipping or to start a 30-day free trial of Prime, customers can go to amazon.com/prime. *Please note that not all shipping speeds are available for all products in all regions, and order minimums may apply. Free shipping for all. All Amazon customers can shop hundreds of millions of items including every product category with free shipping, and this holiday season, there is no minimum purchase amount on orders delivered in time for Christmas. Free shipping is perfect for customers who don’t currently need Prime’s two day shipping or faster service on more than 100 million items. Visit amazon.com/freeshipping for more details. Delivery as fast as today. Prime FREE Same-Day Delivery and Prime FREE One-Day Shipping is now available to members in more than 10,000 cities and towns coast-to-coast. Tens of millions of Prime members can shop with FREE Same-Day Delivery available on more than three million items – the largest same-day selection in the U.S. including the best gifts like toys and electronics, as well as home, fashion and everything you need to enjoy the holidays. This is, of course, available on top of unlimited free two-day shipping on more than one hundred million items in the U.S., exclusively for Prime members. More shipping information including a zip code finder is available at amazon.com/sameday. Holiday essentials delivered in a flash with Prime Now. Prime members in more than 30 cities in the U.S. can benefit from free ultrafast delivery on tens of thousands of items across dozens of categories, perfect for last minute parties, gifts or travel. Last year, customers used Prime Now to get all the last-minute necessities – gifts like Echo Dots and Amazon gift cards, holiday decorations like a 74 Piece Assorted Christmas Ornament Set and even Tollhouse chocolate chip cookie dough for Santa’s cookies – delivered by 11:59 pm on Christmas Eve. If holiday meal preparation is top of mind, Prime members can shop groceries from Whole Foods Market through Prime Now in as little as an hour in 60 cities, and grocery pickup in as little as thirty minutes in select cities – making holiday gatherings or last minute baking even easier. See if delivery or pickup is available in your area at primenow.com. From Amazon Key to Amazon Lockers – Enjoy secure in-home delivery and convenient pick up options. Prime members in 37 cities and surrounding areas across the U.S. have access to Amazon Key, the service that radically improves the convenience of receiving deliveries and granting secure home or car access for guests. For customers who prefer to pick up their packages when it’s convenient for them, Amazon Lockers not only offer a safe and secure way to receive Amazon packages, but also to return. Available to all Amazon customers in more than 900 cities and towns across the U.S., Amazon Lockers are strategically located near offices, convenience stores, grocery stores, apartment buildings and malls. Earn double rewards at Whole Foods Market. From December 17 – 24, Amazon Prime Rewards Visa Cardmembers with an eligible Prime membership can earn 10% Back on up to $400 in total purchases at Whole Foods Market stores. Amazon Rewards Visa Cardmembers can earn 6% Back. Prime members shopping at Whole Foods receive deep discounts on seasonal items and an additional 10 percent off already discounted items all year long, making grocery shopping even sweeter. Shop in Store. With more than 100 Amazon store locations in 22 states, customers can shop for highly-rated gifts, devices, and smart home accessories in-store this holiday season. At Amazon Books, discover books, test-drive devices, and shop other customer favorites, including, “Most-Wished For Books,” “Gifts for the Host and Hostess,” local top-sellers, and selections from the Holiday Toy List. Amazon 4-star carries highly rated products from top categories like kitchen, home, toys, books, games, devices, and consumer electronics. Shop exclusive in-store deals and features including, “Holiday Entertaining Table Top,” “Most Wished For,” and find selection from the Holiday Toy List, Electronics Gift Guide and more. Customers can also try out the newest Amazon devices and learn more about services like Prime, Audible, Kindle Unlimited, and Prime Music at Amazon Pop-Up device kiosks. Visit amazon.com/stores to find a location nearest you. Give the Gift of Prime. The gift of Prime guarantees your loved ones can experience the best of shopping and entertainment from Amazon, plus access to fast, free shipping. Visit amazon.com/giftprime to purchase three months ($39) or one year ($119) this holiday. Amazon Gift Cards are redeemable for millions of items storewide and never expire. Customers can send digital gift cards via text, email, or messaging app; find a great selection of gift cards that can be printed at home; or choose to mail a boxed or packaged gift card with free one-day shipping, or through Prime Now for even faster delivery. Shop this season’s new selection at amazon.com/giftcards. According to Amazon’s recently published Best of Prime 2018 report, Prime members worldwide ordered more than two billion products with one-day delivery or faster in the last year, showcasing the breadth and value Prime members enjoy in delivery speeds. In addition, one of the fastest Prime Now deliveries in 2018 in the U.S. was 8 minutes in Berkeley, CA. To view the full report, including what Prime members shopped for, watched, listened to and read, visit amazon.com/bestofprime. Prime was designed to make your life better every single day. Over 100 million paid members around the world enjoy the many benefits of Prime, including the best of shopping and entertainment from Amazon. In the U.S. that includes unlimited access to award-winning movies and TV episodes with Prime Video; unlimited access to Prime Music, Prime Reading, Amazon Photos, Twitch Prime; early access to select Lightning Deals, one free pre-released book a month with Amazon First Reads, and more. Prime members can also get deep discounts on select popular products at Whole Foods Market plus an additional 10 percent off hundreds of sale items. Prime was built on the foundation of unlimited fast, free shipping and members receive Prime FREE One-Day Shipping and Prime FREE Same-Day Delivery in more than 10,000 cities and towns, free two-hour delivery with Prime Now in more than 30 major cities and unlimited Free Two-Day Shipping on more than 100 million items. Start a free trial of Amazon Prime at amazon.com/prime.